A young meteorologist from A2 Steam explaining cloud types. 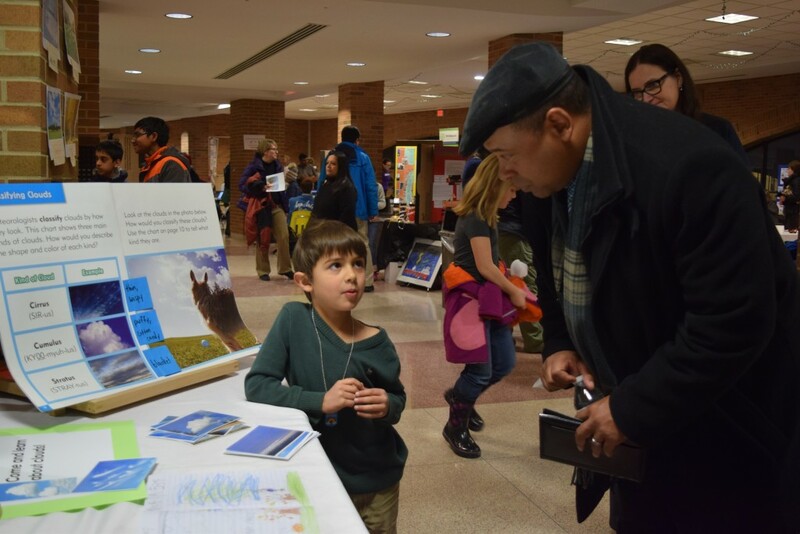 The STEAM Expo gave young students the chance to show off their work and practice public speaking as they explained their pulleys, bridges, and other projects. These kids also had plenty of hands on opportunities with groups like the Maker Works and students from Pioneer High School allowing them to put together and keep projects made from parts produced by 3-D printers. High-tech printers are playing an important role in a tile mosaic artwork third graders from A2 Steam are making. Teacher Bill Van Loo says the students use a computer program to design characters that are turned into physical items thanks to the printer. “Then the students work with the art teacher to make clay tiles using the stamps created by the 3-D printer,” Van Loo says. The resulting tiles will be put together into one big piece of art. Several robotics teams were also on hand to show off their work. This is Pioneer senior Carly Riegger’s second year as a member of the Pi Hi Samurai, the school’s FIRST Robotics team. Riegger says she’s always been interested in science and art. She served on the mechanical part of the team last year to get hands on building experience. This year she opted to work on the business and marketing part of the team because she wants to have experience in the business side of making and selling art. 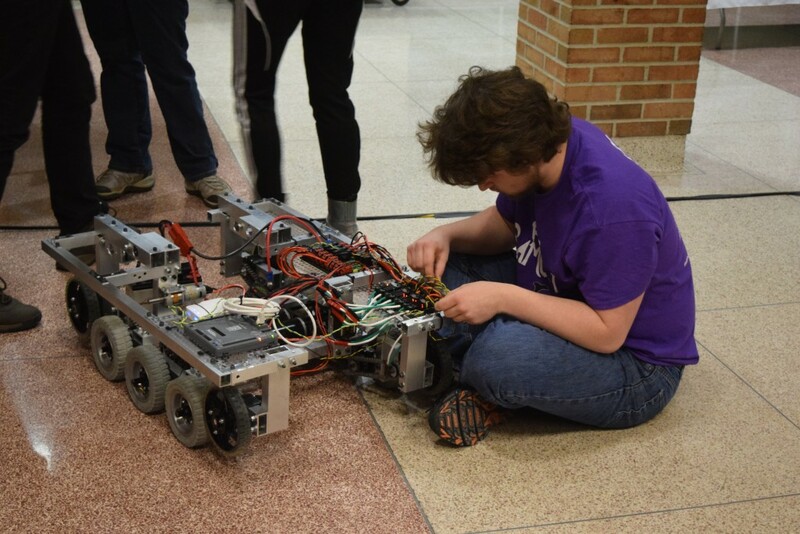 A member of the Pi Hi Samurai team makes adjustments on their robot. 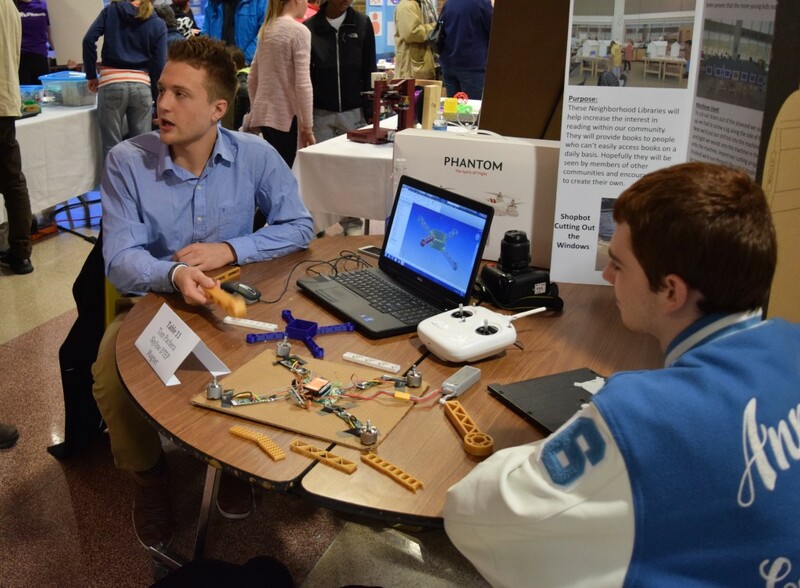 The Design, Technology, and Environmental Planning Magnet capstone project Skyline High School seniors Ryan Heetderks and Jacob Thomas are developing could soon bring them into the world of business as well. Their project started with a broken drone body that they hope to replace with parts they make with a 3-D printer. Over the last two months the pair have been designing, building, and testing modular parts that are lighter and cheaper for individuals to make than the single piece body that originally came with their drone kit. “The great part is it’s all just software, so we could just sell the file online if it works,” says Heetderks. Ryan Heetderks and Jacob Thomas with some of the parts they are making using a 3-D printer to create a new body for a drone. The STEAM Expo also gave local businesses the chance to share some of their work and let students know about careers in the field. Menlo Innovations also let kids program Lego robots to either trace a course on a piece of paper or try to complete a maze. Menlo’s Chance Cyphers says the STEAM Expo was a great experience for kids interested in technology. “I didn’t have this opportunity in school, I’m kind of jealous,” Chance says. 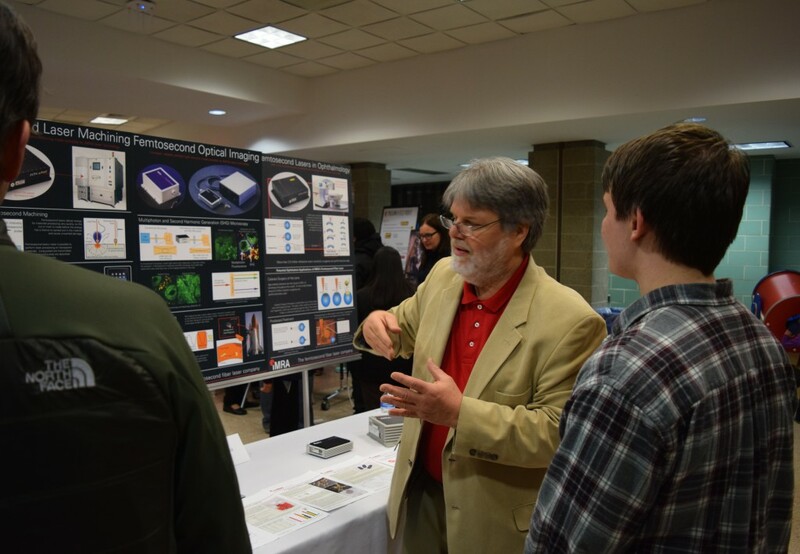 An IMRA America scientist talks about his career and the many uses of lasers.